I would very much appreciate your help on identifying a (Chinese or Japanese) pot with a mark on its neck similar to a infinite symbol, sort of like a fish outline, or the ancient Christian symbol "ictus". This piece was acquired in NY some years ago by a relative. I have looked through your web page - very useful - however I have not been able to figure this piece out. I have sent you some pictures, along with a close-up of this symbol. From what I have seen on your web page I believe I have a Qing Dynasty Yongzheng period Jar. Could you help me confirm this and if so, I would like to find a buyer for this Jar. Thank you for sending me the pictures of your Ginger Jar. Regarding a date I could only give you my personal opinion and that is, I personally believe this jar dates to the period from the late 19th century up until the first decades of the 20th century. The collector's marks on the base are really impressive and I feel I might have a long way to go before I have "won" an argument against all of that authority. What still leads me to think different then the previous owners, are several features. It is the style and theme of the decoration, the way the enamels are applied, the un-proportionally large heads of the figures and the use of iron red and the graded way it is applied, along with the quality of the glaze and paste. Still I could well understand why it once was considered a Yongzheng (1722-35) period piece. One of the features that would well match a Yongzheng date is the spiral pattern visibly through the glaze on the base. Another is the combination of mid 18th century opaque - Famille rose style - enamels and early 18th century translucent - Famille verte style - enamels. Unfortunately this combination occurs also by the end of the Qing dynasty, or the period I would like to put this piece in. Without being able to handle the jar it is unfortunately impossibly to get any closer than this on a date. As for the "infinity/fish" mark I can't explain it. One possibility could be an owner�s signature or some kind of symbol added as a help to match a lid to the jar. - As you have mentioned, the sign is to match the lid and the jar. Indeed you are right. It is very common to see these marks on Straits Chinese porcelain pieces, in fact the stylised fish mark is frequently encountered. Bowls and lid, jars and covers, etc frequently carry similar marks. 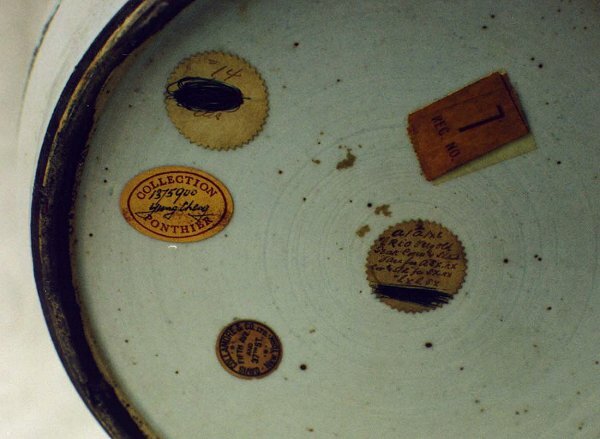 Collectors sometimes rely on the marks to determine whether the lid matches the body. However, these days it is common for the marks to be tempered with or erased. As for this jar, that mark may also help date the jar to the late Ching period.